Mountain View Market Co+op has begun its third annual Giving for Thanksgiving donation drive to help feed local families in need during Thanksgiving. The Co+op will be accepting donations for Giving for Thanksgiving from November 1, 2018 through November 20, 2018. Mountain View Market Co+op started its Round Up at the Register program in 2016. Four times throughout the year, cashiers ask shoppers if they’d like to round up their total to the nearest dollar and donate the change to a selected cause or charity. Since the Round Ups beginning, Mountain View Market Co+op has collected and distributed over $7,000.00 to local charities and causes. There are no administration fees or other hidden fees - one hundred percent of the money collected is given directly to the charity. Mountain View Market Co+op has done Round Up at the Register donation collections for students in need with a school supply drive, has helped provide 1,260 school lunches to public school students and have teamed up with local animal charities ACTion Programs for Animals and Broken Promises SW to help pets and animals in the community. 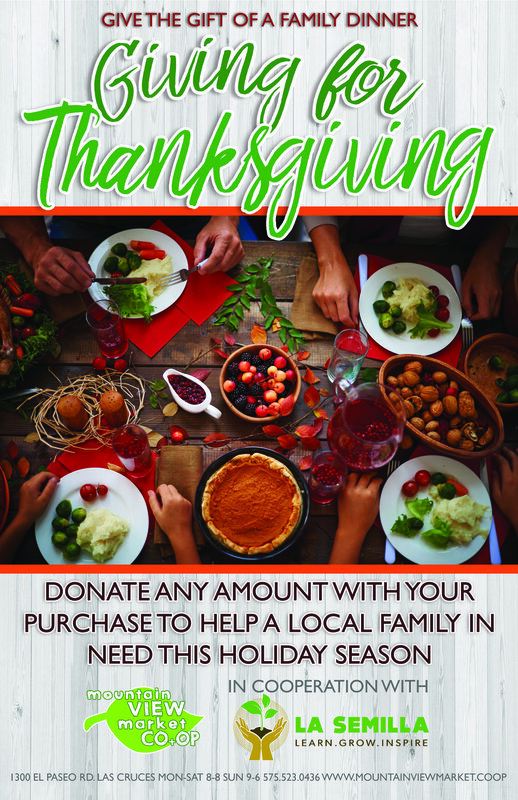 Every year, Mountain View Market Co+op commits to donating a set number of Thanksgiving dinners to La Semilla Food Center to distribute through their food bank in Anthony, New Mexico. In 2018, Mountain View Market Co+op will donate at least thirty dinners. The money raised during the Round Up goes toward offsetting the cost of the meals. Each dinner includes a turkey, stuffing mix, mashed potato mix, canned vegetables, and the basic ingredients to create a pumpkin pie. All food comes from the Co+op and much of it is non-GMO and organic. The families at La Semilla receive the same high-quality food that Mountain View Market Co+op shoppers and their families will enjoy. Meal kits are delivered to La Semilla before Thanksgiving to ensure that area families will get them in time. Any local 501C3 non-profit can apply to be a Round Up recipient. The application is available on our website. Members of the Co+op ownership vote upon the applicants during the annual owner meeting each October. The 2019 Round Up recipients have already been selected, but interested charities are welcome to apply for positions in the 2020 calendar.